The Read Harder Challenge is celebrating it's 5th year. This year's challenge was created and written by Rachel Manwill. This annual challenge is designed to let you expand your reading with new genres, authors, and points of view. There are 24 tasks this year, an average of 2 books a month. You can count 1 book for multiple tasks as long as it fits into those tasks or you can count 1 book per task. 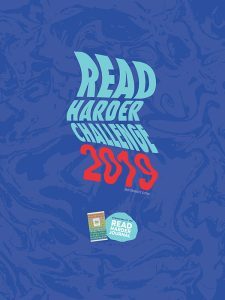 Download the Read Harder Challenge 2019. Every month, I will be posting book recommendations for each task that the library has to offer. This month, I will have recommendations for an epistolary novel or collection of letters and an alternate history novel, which are linked below. What is an epistolary novel? It is when a writer uses letters, journals, and diary entries in their works, or they tell their stories or deliver messages through a series of letters. Sometimes, writers use newspaper clippings, diary entries, and electronic documents like emails, blogs, radio broadcast, and recordings. Alternate History novels are fiction that is based on history and that explores what might have happened if certain historical events, figures, etc., had been different.